Tony Abbott’s ‘Warringah motion’ for party reform was passed by 748 votes to 476. The Abbott forces are seeking to drive home their sweeping Sunday victory in winning rank-and-file endorsement for reforming the New South Wales Liberal Party by putting a three-month deadline on the changes being ratified. A special convention of party members voted overwhelmingly for motions from the former prime minister’s Warringah federal electorate conference (FEC) backing plebiscites for preselecting all candidates and direct election by the party members of those who run the party organisation. This comes as the latest Newspoll, published in The Australian, shows the Coalition continuing to trail Labor 47-53% in two-party terms. This is the 16th consecutive Newspoll in which the government has been behind. The Coalition’s primary vote rose one point to 36%, while Labor also rose one point, to 37%. One Nation slipped from 11% to 9%; the Greens fell from 10% to 9% since the last poll a fortnight ago. Malcolm Turnbull’s net satisfaction improved four points to minus 20; Bill Shorten’s net satisfaction was static on minus 20. Turnbull widened his lead as better prime minister from eight points to 11 points. At the convention of NSW Liberal Party members, the plebiscite motion was passed by 748 votes to 476, and the accompanying motion by a two-to-one margin. The endorsement of the “Warringah” model is a huge challenge to the factional grip of the state division held by the moderates and soft right. The changes would likely see the division move to the right, in line with the political colour of its rank-and-file, and make it harder for moderates to win preselections. But the reforms have to be approved by the state council before they take effect. Given the majorities on the key votes were so decisive, and backing crossed factional lines, it would be hard for the current powerbrokers to resist the general thrust. But there could be a struggle ahead over timing and detail. But a statement by state president Kent Johns suggested there would not be any rush. “The convention result reflected the members’ desire to reform some of our organisation’s internal processes, and serves as a clear demonstration of participation by our membership,” he said. Turnbull positioned himself carefully in his address to the convention on Saturday so as not to be caught in the firing line if the Abbott push won. He stressed his support for plebiscites, saying every member should have a say in selecting candidates. It was widely believed, however, that he would have preferred a more circumscribed model. But the convention voted down or didn’t reach motions attempting to impose some restrictions. These included having a longer eligibility period and an “activity test” before members could vote, and the grandfathering of electorates with sitting members. In the Warringah model the only condition on party members voting in the plebiscites would be that they must have been a member for two years. The present preselection system has candidates chosen by panels comprising local delegates and non-local members. Neither Turnbull nor premier Gladys Berejiklian were at the convention when the vote was taken. Later a spokeswoman for Turnbull said that as the prime minister had said at the convention: “He has long supported that all Liberal Party members have a direct say in preselections. The PM wants to ensure that every member of the party knows that their voice is heard and respected. “The PM made it clear yesterday that plebiscites for preselections are a good idea, but hardly a new one. Every other Liberal party division has adopted them,” she said. 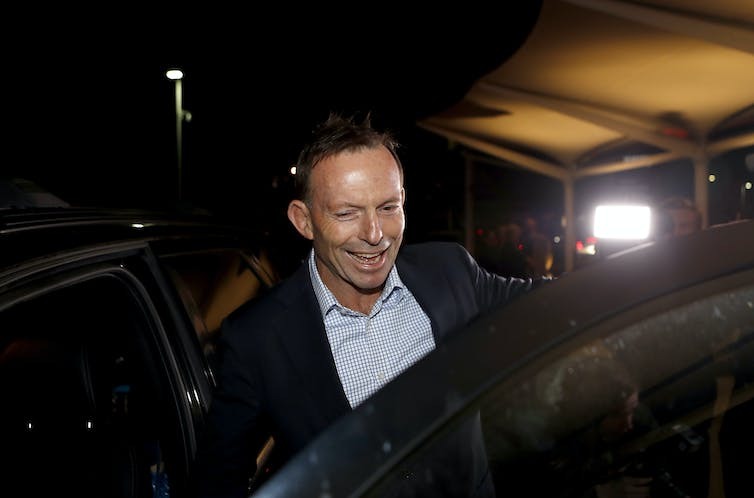 Abbott emailed members in his electorate: “This is a great advance for our party – and it would not have happened without the hard work of the Warringah conference led by our president, Walter Villatora. “There’s more to do, of course. Democratisation now has to run the gauntlet of state council; but this is potentially a wonderful new start for our party. A revitalised, less factionalised party will be really important to winning the next election. Cory Bernardi, who formally defected from the Liberal Party on Tuesday, says he aims to provide the many disillusioned conservative voters with “a principled, credible and stable alternative in which they can vest their vote”. As some ministers lashed out bitterly at him, accusing him of betraying those who had voted for him, Bernardi said the July election had seen one million votes leave the Liberal Party for alternatives. “My ambition was always to bring those people back into the tent. I regret over the last seven months or so we see more of them leaving the tent. That says to me there is a serious problem,” he told a news conference. Earlier, in a speech lasting less than five minutes, he told the Senate: “The body politic is failing the people of Australia”. “When as a younger man I joined the ship of state, I was in awe of its traditions and the great captains that it guided us on our way. But now, as the seas through which we sail become ever more challenging, the respect for the values and principles that have served us well seem to have been set aside for expedient, self-serving, short-term ends. That approach has not served our nation well. Before his announcement, Bernardi rang Prime Minister Malcolm Turnbull, but he did not attend the Coalition parties meeting to inform it of his decision. He justified this later by saying he had already resigned from the party and so was not eligible to attend. Turnbull told Coalition MPs the honourable course would be for Bernardi, having been elected as a Liberal, to resign from the Senate – a line reflected in sometimes bitter comments from other Liberals, including South Australian Liberal cabinet minister Christopher Pyne, who tweeted that Bernardi should quit and recontest as an independent. Tony Abbott, in a post on Facebook which appeared to indirectly criticise Turnbull, said he was “disappointed that more effort has not been made to keep our party united”. “No government entirely satisfies all of its supporters. This is not an argument to leave; it’s a reason to stay in and fight more effectively for the things we believe in,” Abbott said. Although critics such as Immigration Minister Peter Dutton said the defection “dilutes our efforts to defeat the Labor Party”, Bernardi claimed it could “strengthen the ideological grounding of a centre-right government and that is my wish”. His Australian Conservatives party will run Senate candidates, he said. Bernardi rejected allegations that he had betrayed the South Australians who had supported him as a Liberal at the election. He said that going into the last election he had not intended to break away. He had said the election result was not good but “none of the people who said the base doesn’t matter, the conservatives have got nowhere to go, have been held to account for that result”. He couldn’t say there was one straw that broke the camel’s back for him but “an amalgam of circumstances”. The government’s leader in the Senate, George Brandis, said Bernardi had done the “wrong thing”. “Seven months ago senator Bernardi was happy to stand before the people of South Australia to say he sought their endorsement to serve for a six-year term as a Liberal senator. Brandis said the government would deal with Bernardi “as we deal with all members of the crossbench, in a professionally courteous and respectful way”. “But we do not condone what he has done. Might I say, that if one seeks to restore confidence in the political class, it is a poor way to begin by breaking the promise one makes to one’s electors to serve for the political party on whose platform and whose ticket one stood.